On Sunday, I cracked my first wheel of homemade blue cheese. Carla and I visited my parents for the weekend in upstate New York. Growing up, I remember my Mom always keeping blue cheese in the house. She would either crumble it in salads, or get a jar of blue cheese dressing and dunk in hard pretzels as a snack. Of all the cheese types, I don't eat a ton of blue cheese, so my parents graciously offered to help out with our experimental taste-test. My mom even went so far as to pick out a bottle of port. This blue cheese is based off a recipe for Stilton. I expected a crumbly curd with a slight creamy texture and a sharp bite. I hoped that the raw milk (all Stilton must be pasteurized by law) would propel my amateur efforts into a nearly uncharted realm of deliciousness. The wheel was aged for 3 months, which seemed to be plenty of time for the blue veining to spread throughout the cheese. As I cracked the wheel's stinky rind, I worried the cheese might actually be overripe. Looking at the cheese, I saw the complete opposite. Only a few whorls of fuzzy blue mold hovered in the pale yellow paste. The taste was mild, with a light grassiness you'd find in raw milk cheese. The finish was slightly "blue," with a brief tingle of acidity. All in all mild. So here's what I think happened: My cheese cave is buzzing with stinky bacteria, after all the washed-rind cheeses I've made in the past. They stuck to the wet rind of the blue and created the super-strong rind. Sadly, I think I overworked/overpressed the curd, resulting in too few air pockets for the blue to grow. Even piercing the blue cheese with the steel spike only added marginal blue veining to the cheese. The one thing I did get spot-on was the acidity. 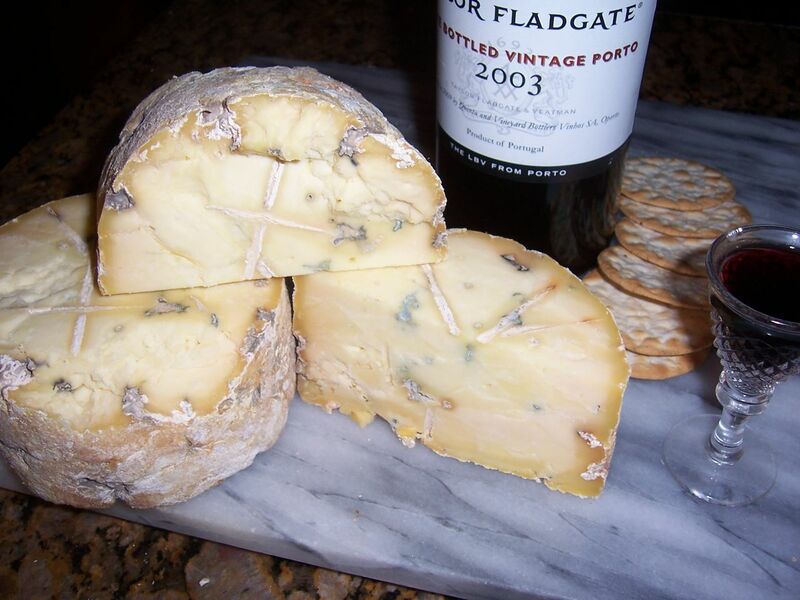 Stilton isn't salted for a few days, allowing the acidity to build up. As soon as you add salt to milk, the souring stops, along with the acidity. To end on a positive note, it's hard to be frustrated when you're eating cheese and thinking about making more cheese to solve your problems.